A4 sheets combine the look and performance of paper with the added strength and robustness of a polyester film. 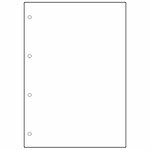 Ultra-tough waterproof A4 paper and card ideal for prolonged use in a wide range of Xtreme Environments where durability against exposure to the elements; handling or cleaning is critical. 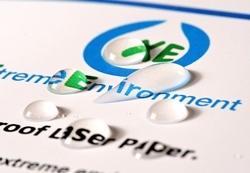 Alternatively, for optimised printing on mid to low speed dry toner based colour copiers or individual desktop laser and LED printers, choose XE DESKTOP WATERPROOF LASER PAPER AND CARD - A4 sizes. Engineered for superior efficiency on 60ppm+ high speed, dry toner colour digital presses and production colour laser printers.